Some horizon operations and processes use a weighted method to interpolate and extrapolate results. When creating new points, the operations use values from many neighbours. These settings affect how the calculation is performed. Values closer than Max search distance are used in the calculation. The closest valid points are used in the calculation. Max search distance has no effect. 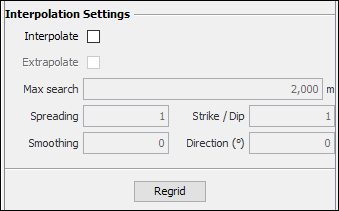 Insight determines values for the new points using the max search, spreading, smoothing, strike and dip settings. Use the strike / dip setting to affect the “shape” of the operation. Specify the Strike direction (azimuth) in degrees, as measured clockwise from compass north. Both algorithms use weights when determining the value at a location. Values closest to the location have the most influence on the result. Increasing the value reduces the influence of distant points. Use lower values (0.5 to 1) for a smoother result. Use higher values (greater than 1) for a less-smooth result.